Nice is blessed with an average 300 days of sunshine a year. What a better place to let your love shine than in front of the sparkling Mediterranean in a lovely and “nice” spot? A picturesque beach front setting and a quaint old town, romantic Nice has attracted lovers for centuries. But it has also been a longtime magnet for famous artists and writers such as Matisse, Chagall, Dumas, Nietzsche, Apollinaire, Flaubert and Victor Hugo. All drawn by the stunning light of its Mediterranean coastline. Be part of the art with your tailor-made wedding vows ceremony created by our officiant in Nice! Everyone knows about “La Promenade des Anglais” (the English waterfront path), or the breathtaking Cap Ferrat. These are absolute top beach destination to set your love ceremony. But there are even more ways of falling in love in Nice. One of out favorite spot for holding ceremonies there are the impressive Mont Boron cliffs where Nice castle is nestled. On top of a hill, it offers a breathtaking view over the whole coastline. Wether your want to elope with your love, propose, renew your vows or wed, its stunning sea backdrop will be a perfect setting for your photos and videos of that unique day. Nice has always been a hit for destination weddings and vow renewals. It offers the advantages we all want for our special day: sun, stunning background, and a nice relaxed feeling. If you are looking for a great place to elope or wed, and have a bit of a holiday while you are at it, then Nice is a perfect pick. Fabulous markets, enticing old town, superb architecture, Nice has many ways to attract you. Wether you want to spend this special day just the 2 of you, or elope with your friends or family, Nice will work out perfectly. You can watch here a video of a lovely wedding anniversary we celebrated there. An old celebration company, we have developed a network of reliable, experienced and caring professionals to work with us in Nice. We know where to find the best local florists, hair and makeup stylists, car vendors, photographers or video producers and will be happy to share this network with you! Because you are going to get married in a foreign country, it is important to be confident that the people you are going to work with can be trusted a 100%! That’s exactly what we offer you. We also think you might want to bring or sent back home memories captured on that special days with the people you love and who could’t be there. Choosing a reliable, experienced photographer is an absolute must. 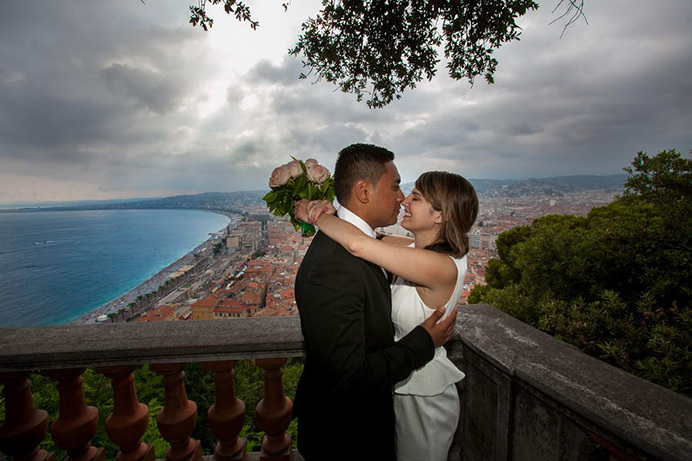 Having celebrated now more than 350 ceremonies, we can tell you that your special day in Nice will be a wonderful and dream one. Our celebrant in Nice has been officiating at Love Gracefully for 10 years now. French native but fluent in English he will be more than a helping hand to you. With you at every step of the organization of this unique day, he will tailor-make a ceremony that look just like you. Because we know how important it is to have a ceremony that fits you and only you, and to feel the uniqueness of this moment, this is exactly what we do : we carve personalized love celebration. Our vows will be one-of-a-kind because, unlike our competitors, we don’t work from template, but rather write each time, something new. We are committed to make this day the most romantic and touching day of your loving life and truly look forward to meeting you in Nice !